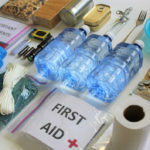 No matter where you live, or how minimal the threat of a natural disaster or emergency scenario might be, every household should have some kind of basic survival kit. If you’re just getting started on building your survival kit, you’ve made a commendable decision to make the first step. You’re probably asking yourself questions like, where should I start? How much of each item should I include in my kit? The answers to some of these questions are unique to your individual living situation, including variables like how many people you live with, where you live, medical requirements, and so on. After you go through the checklist below and start to build your basic survival kit, take into consideration the age of those in your home, the needs of any pets you have, and so on. Most of the items we list here are inexpensive and readily available at most stores. Most important of all, stocking up on these items could mean saving the lives of your family members. Every survival kit should start with the necessities of food and water supplies. Emergency preparedness agencies like FEMA and Ready.gov recommend that every survival kit should contain enough food and water supplies to sustain you and your family for at least 72 hours. For water, your basic survival kit should include a gallon a day for each one of your family members. This is for both drinking and for sanitation needs. It’s a good idea to stock up on water for cooking as well, in case you’re stuck in a disaster or emergency scenario where your water source is shut off or the water becomes contaminated and undrinkable. You can opt to purchase standard bottled water which will have a shelf life of two to three years, or you can decide on purchasing water rations that will last much longer than that. As far as food goes, be sure to include non-perishable food items like canned goods and other food items that have a long shelf life. Whatever type of food or water supplies you add to your basic survival kit, be sure to always check the expiration dates and throw out any old items and replenish with newer products. Ideally, you should consider stocking up on enough survival supplies to last for up to a week, but 72 hours worth of supplies is the recommended minimum. After food and water, there are some essential emergency items that you won’t want to forget to add to your list. Flashlights and radios with extra batteries are essential, as well as a help whistle, raincoats or ponchos, matches, a fire extinguisher, warm clothing and blankets. Additionally, keep sanitation items like a basic dust mask for breathing when the air might be contaminated, moist towelettes, garbage bags and paper towels in your kit. Keep tools like a wrench or pliers to shut off your utilities and a manual can opener for food purposes. It’s always a good idea to make copies of essential documents like birth certificates when possible and permissible to do so. A map of your local area can be a lifesaver as well, because your GPS might not be available in the event of a disaster. Other important additions to your survival kit will be medical supplies. Add a first aid kit with up-to-date items like bandages, bacitracin, ibuprofen and antacids, and so on. It is also recommended that you If you have young children or elderly people living in your home, be sure to take their individual needs into consideration while building your survival kit. Take extra care and attention to include up-to-date prescriptions for those in your household as well. If anyone in your home wears glasses, it’s a good idea to include a spare pair of glasses, just in case their main pair breaks or gets damaged. Please don’t forget about the pets! Far too often, pet owners get caught in a natural disaster or emergency situation and don’t have the essentials to keep their pets safe and sound. In addition to enough food and water for your pet to survive, include some kind of toys or anything that your dog, cat, etc. likes to play with or keep occupied with. Your pets will not understand what’s happening in a disaster scenario, so they’ll be relying on you to keep them as comfortable as possible. If you must evacuate, make plans with a relative or neighbor to come get your pets so they never get left behind. While these checklists intend to get you started on building your basic survival kit for you home, it’s also important to build kits for your vehicles and office as well. You might not be caught in a disaster or emergency scenario while you’re at home, so be sure to plan accordingly. While you can certainly build a quality survival kit by purchasing all of these items discussed here, buying a done-for-you kit from More Prepared will take the guesswork out of expiration dates and what to include. We carry survival kits for your home, office or vehicle that include enough food, water and emergency supplies to sustain you, your family members and your coworkers. Each kit has a shelf life of 5 years. If you are looking for custom kits, we are happy to answer any questions you may have. We also do fundraisers as well, and we love seeing school functions that sell survival kits instead of your typical sugary candy bars. Fill out the questionnaire form today to get started, or place an order directly if you’re ready to do so. Your life and lives of your family members could depend on it.